Checkout lines aren’t the worst thing in the world. There’s tabloids, gum, and those funny comments cashiers like to make about all the shameful things you’re buying. Still, Amazon is over it. Today, the company unveiled Amazon Go, a new physical store in Seattle where you can buy “grocery essentials,” ready-to-go snacks, and “chef-designed Amazon Meal Kits.” When you’re done shopping, you’re finished. There’s no checkout process. 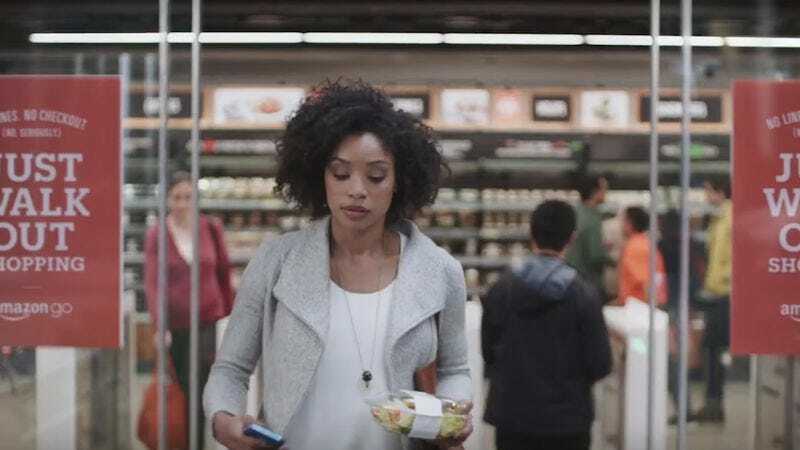 It works like this: Customers check in with the new Amazon Go app, then get to their shopping. Amazon claims that by using “computer vision, sensor fusion, and deep learning”—the same technologies used in self-driving cars—it can automatically keep track of your items, even ones you pick up, violently shake, and put back on the shelf. Purchases are then charged to your Amazon account. Confused? This video should help. This isn’t Amazon’s first bid at brick-and-mortar shopping, what with the company opening a number of physical bookstores this year in cities like Chicago, Boston, Portland, and Seattle, where they’re headquartered. CNN points out the potential of Amazon Go: “By eliminating much of the staff needed to operate a store, Amazon keeps costs lower than traditional competitors. It’s also in a strong position to bring together data on its customers shopping habits online and offline to make better suggestions in all situations.” Don’t rush out yet, though. Only Amazon employees can hit up the Seattle store, though the company has plans to open to the public in early 2017. This might be a good time for your neighborhood grocer to start panicking, however. Cashiers, too.